i’m not sure how my sister feels about this, but her girls are very big into party planning. of course i only encourage this behavior and have to ask the important questions – like what is the theme? the colors? what kind of decorations do we have to make? what food will be served? the little one (shown above) has been hanging out in my studio lately and she has a birthday coming up – 7 years old. yesterday we sat around the conference table with a note pad and had a meeting about the cake (that has been my task since they were born). 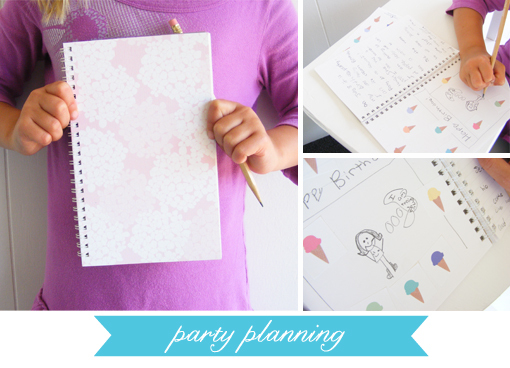 today when she was in my office she got one of my travel journals and wrote a little plan for her party. on the unlined side she drew her vision (something i’m always asking about) — clearly her plan is to have an ice cream party.